This one was submitted by Stuart fan/Kate parent Elsa Velez. 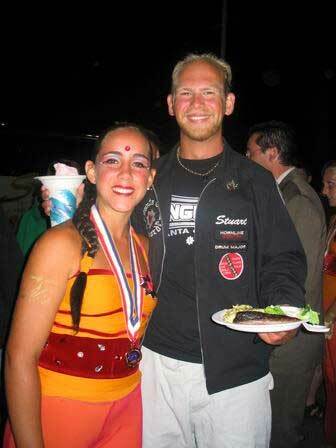 "Santa Clara Vanguard drum major Stuart Shulman and guard vet Katrina Velez share a moment for a snack and photo op following a stellar performance at 2004 DCI Finals in Denver. The corps would depart later that night for Tour of Champions in California." Thanks Elsa!